20-Feb-2005 -- "What a difference a day makes, 24 little hours... " the lyrics of the song were running through my mind as I tagged one of the last remaining confluences in the eastern United States. I had been teaching a Geographic Information Systems (GIS) and GPS "mini-term" for students at the North Carolina School of Science and Mathematics, and a confluence trip seemed like the perfect complement. Despite clearing the visit with the security staff, something had not been communicated during the previous day, and I had to turn around and drive back to Durham. I ended Saturday 19 February with a 600 km beautiful journey but the confluence still had not been tagged. However, I had just completed my lesson for the GIS course I was teaching for the University of Denver about 1pm on Sunday 20 February. I thought I would give 34 North 78 West one final try. I faxed my government identification and paperwork in again, and a short time later, I called them back and received assurance that they were expecting me, and that I had a security clearance. I made great haste in clearing out of the school, because it would take me three hours to reach the confluence, with about three and a half hours of daylight remaining. I drove south-southeast from Durham on Interstate Highway 40, opting this time to take what I hoped would be a shortcut around Wilmington. I saved 10 precious minutes with the sky darkening from an approaching rainstorm. At 4:50pm, I arrived at the guard's station at the Sunny Point Military Ocean Terminal, showed my paperwork, and heard the wonderful words, "we have been expecting you." I received a badge, drove to another guard's station, and then to the security office. I met the Captain in charge, gave him some USGS maps, and hopped into the truck to be escorted to the site by another security staffperson. We drove northeast down the main road to a point about 100 meters from the confluence. 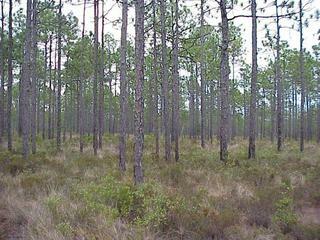 I had been expecting the area to be quite marshy, but the terrain was dry, flat ground covered with brush and pine trees. We spoke about the efforts the base staff does to protect the environment; they seem to realize what a special area coastal North Carolina is. They conduct periodic controlled burns in the area so that the soil will not become overly acidic with falling pine needles. Wildlife includes crocodiles, owls, foxes, and snakes. Although everything was going very well, I was so nervous, given the previous day's events, that suddenly it all would collapse. My nervousness made me wander around the countryside, and therefore I handed the GPS receiver to the security officer who navigated us to the point. Success! The confluence lies in a modest sized clearing but surrounded by pines and covered with some vines, thorns, and grassy brush about a half meter high. It lies about 100 meters southeast of the nearest road. The GPS receiver shows the elevation as only 13 meters above sea level, and it was indeed quite flat there near the coast. We reached the confluence about 5:20pm (my GPS receiver is set for mountain time). We set down the orange cone we had brought, as one of the security officers expressed interest in knowing where the spot was. The temperature was 12 C. A very light rain was falling, but it was absolutely still, and it was a peaceful spot. I had been to 34 North three times before, twice in Georgia and once in New Mexico. This was my third trip to 78 West; the other two visits to 78 West were in North Carolina. I am a Colorado resident but now have visited 5 North Carolina confluences. This coastal confluence reminded me of my trek to 30 North 90 West in Louisiana. We retraced our steps and I picked up my vehicle back at the security office. I thanked the staff for their help in this scientific endeavor, and drove through Boiling Spring Lakes, the nearest town a combination of permanent residents and recreation residences. The darkness fell just as I reached the other side of this community. I reached Durham at 9pm, with a two-day trip time of 750 miles (just over 1200 km). Check it off! North Carolina is complete! #1: View to the east from the confluence. #2: Joseph Kerski completes North Carolina's confluences. #3: Ground cover at the confluence. #4: GPS reading at the confluence. #7: Cone we planted at the confluence site. #8: 360-degree panoramic movie filmed at the confluence site with sound (MPG format).